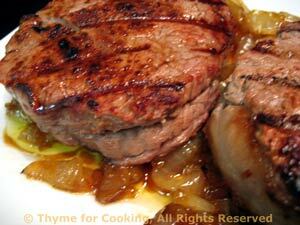 Filet Mignon with Caramelized Onions, easy gourmet dinner recipes. I chose tenderloin for this, but get any cut you like and as nice as budget allows. Use the rest of the onion for Day 1. 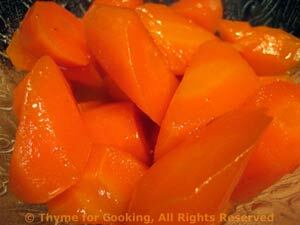 A bit of sugar emphasizes the natural sweetness of the carrots. Peel carrots and roll cut - that is cut the end off of the carrot at an angle, roll carrot 1/4 turn and cut next piece about 3/4 inch away at an angle, roll 1/4 and cut next piece, etc. This gives you interesting looking pieces with lots of surface. Put carrots in small skillet, add stock and cook, covered, 15 - 20 minutes or until vegetables are done. 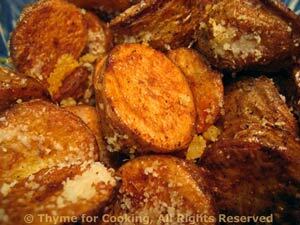 Remove cover, turn heat to medium-high and cook off all but 1 tbs of liquid. Add butter, vinegar and sugar, stirring to dissolve sugar. Sauté until thick and glazed, stirring often, about 5 minutes. Serve.